UpBeat Band opens for Lionel Richie at McCormick Place Convention Center, attendance 8500 for the Society of Human Resource Managers. Read our reviews and articles on Martha Stewart Weddings. 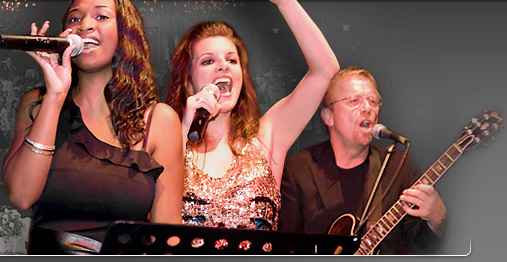 UpBeat Band headlines at Chicago's Premier Meeting and Hospitality Industry Bash. Produced by hereschicago.com at Crobar  Jim Grillo said "I call these guys UpBeat... but the past few years I call them 'Overtime' because the client always wants more..."
UpBeat's R&B Machine gets overwhelming response from the audience and media for it's July 4 Taste of Chicago performance! FOX 32 community affairs director Wanda Wells said "We absolutely loved your group... you delivered great entertainment for the people of Chicago..."
Click above to download ensemble information in .pdf format. UpBeat MUSIC PRODUCTIONS provides a comprehensive live music entertainment service, whether your event requires a versatile five piece group  the UPBEAT BAND, a dynamic 10 piece orchestra  UpBeat Orchestra, a 14 piece orchestra  The Michael Cascio Orchestra, a jazz group  Michael Cascio Trio or jazz quartet for reception music, a string quartet for classical ceremony music, solo piano or strolling violin, a blues group, or a custom theme for a corporate gala, we know how important your special event is  creating the perfect party atmosphere is what we do. Outstanding musicianship will make the difference for your special event, and our artists create a distinctive, tasteful, and unforgettable party celebration. And, we are also a group of really fun people! Looking for a Chicago Wedding Band? UpBeat packs the floor with our Dance Party By Design. Our Professional Emcee takes care of everything. Reviews. Read about our consistent high quality work. Our customized planning administration is all about you. Your wedding should be a joyous occasion – we help organize the planning process and make it easy. Classics. Contemporary. Customized. See our UpBeat Chicago Wedding Bands & Chicago Wedding Orchestra Videos! Looking for Chicago Corporate Event Music? With a diverse variety of musicians, ensembles, and theme party entertainment, UpBeat Music Productions is a trusted standard for creating the perfect atmosphere for your customized event. View our extensive Client List and Sourced References. Diligent planning is essential to any successful event. We start with an in depth assessment of your specific entertainment needs, including all production elements, your guests  attendance, their specific tastes, and nature of the event, including a corporate party, wedding reception, balls, private parties, etc.  all venue considerations, sound reinforcement, lighting, budget and more. Next, we can recommend specific entertainment options that best fit your event, your budget, and the experience that you envision. With our insight, experience, and preparation, we go the extra mile to make sure all the important details you choose are executed perfectly. This includes all administration, necessary rehearsal, specialty songs, custom arrangements, and sound and lighting management. Please feel free to contact us with any questions. Please enjoy our website pages – we look forward to hearing from you!